Driven by technology megatrends and ensuing changes in corporate priorities, the global total addressable market presented to technology, communications and business services providers could grow by almost 50 per cent within the next decade. The global technology spend is likely to increase from USD 2.7 trillion in 2014 to USD 3.5 trillion by 2020 and to USD 4 trillion by 2025, at a CAGR of 3.6 per cent. While there is early evidence of this growth fueled by digital, the quantum and timeframe of this growth will vary depending on the rate of adoption of digital technologies by end customers as well as the technology savviness of enterprises. But the texture of the growth will likely be much different than that seen in the past as digital investments become a high priority for top executives. About 35 per cent of the technology and business services expenditures will likely be on digital technologies by 2020, with the proportion rising to 60 per cent by 2025. Even the definition of digital technology may change, with innovations seen as disruptive today â€” mobile applications, infrastructure- and software-as-a-service offerings, and big data analytics, among others â€” entering the mainstream. 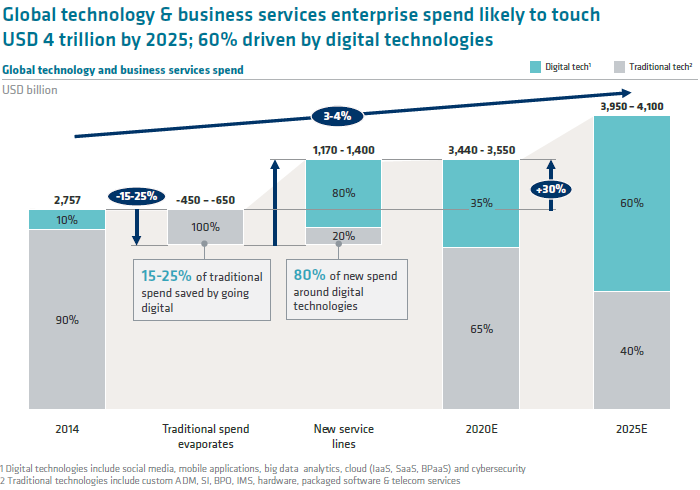 By 2020, Digital Dominates Our analysis suggests that 80 per cent of incremental expenditures between 2014 and 2020 may go to digital technologies. These will include mobile systems, platforms, big data analytics, social media, cloud-based systems, enterprise mobility, and cybersecurity, as well as services needed to integrate these investments with the legacy core technologies. Cloud-based systems: Penetration of applications using software-as-a-service models against total packaged software expenditures will likely grow from 12 to 13 per cent in 2014 to 30 to 35 per cent in 2020. Industry-specific applications, such as Alacra for banking compliance and anti-money laundering processes and GoldenSource for reference data needs, are also making headway. Altogether, software-as-a-service applications will likely grow in terms of share of enterprise spend by fourfold over the next five years. Big data analytics: While the use cases relevant to big data analytics remain very specific and limited, share of spending here against total business expenditures on analytics will likely grow by an average of 28 to 30 per cent a year over the next decade, reaching about four times its current size by 2020. The growth will come from mining a vast field of currently untapped public data, such as â€œlikesâ€, tweets, ecommerce order histories, and social network pictures, as well as using new algorithms, including neural networks and machine learning, to improve predictive models and new analytics use cases tied to application for the Internet of Things. Cybersecurity: Chief information officers consistently cite cybersecurity as one of their top three priorities, and companies are seeking increasingly sophisticated protection. Some global companies are investing in cybersecurity start-ups in an attempt to develop credible protection against threats. In addition to private interest, public spending on cybersecurity will likely grow slightly faster than corporate spending as a result of the increased amount of confidential data held on government servers and mounting fears of cyberattacks by organized, international groups. Enterprise spending on cybersecurity is likely to grow at an average annual rate of 9 to 10 per cent over the next five years. Machine-to-machine platforms: Industry growth will also be boasted by the development of new platforms. For example, expenditures on devices and software related to the Internet of Things are expected to grow by more than 20 per cent a year, presenting a promising new segment for technology service providers. Digital Integration with Traditional – An Additional Driver While digital technologies themselves will provide substantial opportunities for Indiaâ€™s service industry, others will come from the need for businesses to integrate new digital technologies with legacy systems. Over the next five years, up to two thirds of corporate systems are likely to continue to use legacy technology, which will have to cohabitate with new investments. Digital leaders will invest in new technology, relegating traditional systems to the minimum needed, but most companies would build robust middleware systems to integrate front-end digital technology and back-end legacy technology. Expenditures on integration systems could equal 10 to 100 per cent of investment in digital technology. To know more, download the latest NASSCOM-McKinsey study- Perspective 2025, that identifies opportunities Indian technology industry can drive from innovative and disruptive technologies.